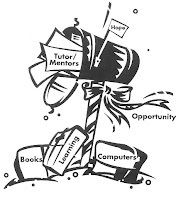 This photo describes the strategy of Cabrini Connections and the Tutor/Mentor Connection (T/MC). While we operate one tutor/mentor program in the Near North part of Chicago (LOCAL), we created the T/MC (GLOBAL)to help tutor/mentor programs grow in all high poverty neighborhoods of Chicago and its suburbs. Through the Internet, we're sharing this strategy and enlisting partners in big cities throughout the country. We'd like to encourage businesses, colleges, civic and health care groups to adopt this local/global strategy. It's very expensive to operate a tutor/mentor program, and it takes many years for a program to become great, as well as a minimum of 6 years for a youth to go from 7th grade to high school graduate. Thus, while a company can put great energy into one or two sites, they really only reach a few kids out of the more than 200,000 living in poverty in Chicago, or the approximately 13 million living in poverty around the country. However, if a company uses its advertising, public relations, internal communications, etc. to encourage employees and customers to get involved in tutor/mentor programs all over the city, or in many cities, it can influence what happens in many tutor/mentor programs, and the lives of thousands of kids. What's great about this concept is that this form of leadership is not really very expensive. It's a mindset. Business uses all sorts of advertising to influence the actions of millions of people. If they apply this same thinking they can influence hundreds of tutor/mentor locations. In addition, they probably will also learn more ways to make the local programs they operate much more effective. That's what we've learned. By operating the Tutor/Mentor Connection we actually have done more to help our own Cabrini Connections program grow. Follow the links at the left side of this page, or skim through the articles I've written over the past 2 years, and learn how your church, business, law firm, university, and/or high school service learning project can adopt this thinking in your own efforts. Have a safe, happy new year. I'll add some more to this blog tomorrow. Does your spirituality drive your social entrepreneurship? This is the question on the Social Edge web site (now only available on web archive) this week. I responded by saying that I believe there has been a spiritual force guiding my 30 years of involvement in tutoring/mentoring, and that this force helps me connect with others at different times and in different ways. I write about these connections on this blog, and in each article, I link to others who I'm connecting with, or learning from. If you browse the links along the left side of this page, you'll see that each leads to other web pages, with listings of other tutor/mentor programs, or with discussions where I contribute and learn. In addition, many of these web sites link to even more sites, where I would like to spend time learning if I could stretch each day into 40 hours instead of 24. I can't do that. Thus, my hope for 2008 is that some of you who read this blog will either take on the role of network builder, researcher, advocate, or you will recruit others in your own network to take on this role. I hope you'll browse the various links and visit the forums that I visit, and that we can connect in one or more. In addition, if you are meeting in other forums where there are great ideas, and a great focus on actions that many people take to help millions of kids stay in school and reach careers, please forward the link to me so I can join, and I can connect others in my network to these new places of learning. Thank you to everyone who has supported Cabrini Connections and the Tutor/Mentor Connection in 2007, with your time, your talent, and your dollars. I look forward to connecting with you in more strategic ways in 2008. Every day I spend time building networks of support for volunteer-based tutor/mentor programs in the Chicago region, and looking for ways to help these programs have a growing impact on the lives of inner city kids and the volunteers who become part of their lives. This networking connects me with many different tutor/mentor programs and supporters in Chicago, and with similar groups and leaders in other parts of the country and the world. On Friday, December 14 this networking took me to Wisconsin, where I was a speaker in a Mentoring Conference held in Kenosha, that served as the kickoff of the Kenosha-Racine Mentoring Network. The featured speaker was the Executive Director of the Minnesota Mentoring Partnership, and another speaker was Kathy Munson, from the Wisconsin Mentoring Partnership. Thus, by organizing this conference, the leaders (from the University of Wisconsin-Parkside) were connecting mentoring leaders from three states. By my writing about this on my blog, I hope I'm connecting mentoring leaders from many other places with these groups and with our groups in Chicago. Mentor Kenosha-Racine has set up their own blog, and I encourage you to connect with them. Following the morning conference, I attended a meeting of the Wisconsin Mentoring Partnership planning team. This volunteer organization has representatives from Milwaukee and other parts of the state and their aim is to build a network mirroring best practices in Minnesota, Michigan and other states. I've met with leaders of this group for over 10 years, sharing strategies of the Tutor/Mentor Connection. After the conference in Kenosha, Wisconsin, I drove back to Chicago to attend a holiday party hosted by Dr. James Galloway, whom I met in September when I participated in a Health Careers conference, focused on American Indian and Alaska Eskimo youth. Following our meeting, I've participated in an on-line forum connecting members of the Pathways into Health Careers network, and Dr. Galloway was a speaker at the Tutor/Mentor Leadership Conference in November. During Friday evenings social gathering, I met others from the public health field, and hopefully some of these connections will become future partners of the T/MC and future supporters of tutor/mentor program growth throughout Illinois and the Midwest. In today's newspapers there were letters to the editor about the Poverty Gap, and articles the drew attention to poverty in various parts of Illinois. In the Parade Magazine the front page featured the highly visible Oprah Winfrey and Denzel Washington, talking about ways to give to charity. The one article that I felt was most important, was one that talked about how the huge charitable donations from the Bill Gates foundation, intended to solve major public health issues around the world, was having an unintended impact of reducing support for basic human services. 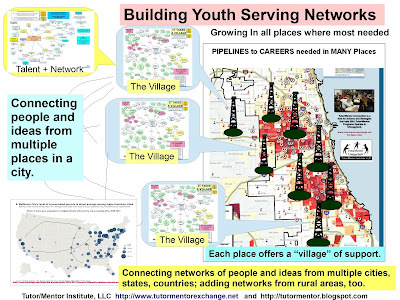 On the T/MC web sites I use charts and maps to illustrate the many different organizations who need to be working in a neighborhood to help youth grow up safely and move to jobs and careers, as well as the many different neighborhoods where such help needs to be funded for many, many years. My holiday wish is that leaders like Gates, Denzel and Oprah would support complex problem solving blueprints such as I'm piloting so that their visibility could result in a distribution of flexible, on-going operating dollars, from big, and small donors, to all of the different non-profits who are part of the village needed to raise children in America and the World. Mayor Daley and Arne Duncan have called on the Chicago business community, and local and national foundations to help raise $50 million to support Renaissance 2010 which is the Mayor's plan to make 100 new schools available in Chicago to under-served youth. In response, the Civic Committee of The Commercial Club of Chicago committed to help raise $25 million and created the Renaissance Schools Fund (RSF) to support the transformation of Chicago’s public schools through greater choice and competition, and to provide all families with high-quality educational options. This map shows locations of new or planned charter schools. A list of corporate donors shows commitments ranging from $250,000 to over $2 million. The map, list of schools and links to other stories can be found on the Medill Reports web site. 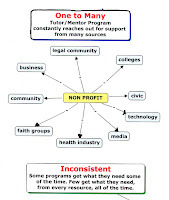 The Tutor/Mentor Connection (T/MC) supports this strategy, but as the chart above shows, we also feel that unless funds are not put into learning and mentoring that takes place out of the school and beyond the school day, the new schools will soon be struggling with the same challenges of the former schools, in that not enough kids come to school motivated, and prepared to learn, and not enough kids have an adult network expanding their learning, their aspirations, and their opportunities for jobs and careers beyond school. Just getting a school started will not be enough to assure the success of a youth from when he enters one of these new schools at first, 6th or 9th grade. Business needs to stay involved for many years, encouraging employees to be involved as volunteers, leaders, donors, and innovating workforce-development strategies that can help more kids build the soft skills needed to succeed in school and work. It's a good challenge as we head into 2008. If you've read past articles on this blog, you can see that I'm singing the same song, over and over, trying to connect people who can help, such as volunteers, donors, business leaders, with tutor/mentor programs that have a long-term, volunteer-based strategy of mentoring inner-city kids through school and into careers. In many ways, I'm a choir of one, I'm singing solo. I'm a whisper in the wilderness. In order to achieve the goals I write about, I need to expand the size of the choir, enlist more people to sing different parts of the music, and take different roles in this orchestra. The result, is a growing reverberation, or Hallelujah Chorus, of people supporting youth in different neighborhoods of Chicago, and different neighborhoods of other big cities around the country...and the world. So, how do we do this. How do we build the public will needed to not just support tutoring/mentoring, but willing to sacrifice more than token levels of time, talent and dollars, for many years, even decades. I don't have a simple solution. I do have a path. I point to web sites where other people are writing about this topic, and educating their readers. Thus, every time you visit my blog, or the Tutor/Mentor Connection web site, you're pointed to other places where researchers, writers, tutor/mentor leaders, are educating readers about why and where and how they can help build this public support for programs that use volunteers in many roles to mentor inner city kids toward jobs and careers. Everyone who reads one of my articles and shares it with a friend, or who passes on a link to the T/MC web site, is taking a role in this choir. Thank you. Since we're in the year-end fund raising period, here's a few articles that I encourage you to read which related to building public support, and raising funds for non profits. I hope many readers will uses these ideas to raise money during December, and 2008, for volunteer-based tutor/mentor programs, such as Cabrini Connections. Follow the links at the side of this blog and in the LINKS LIBRARY and you'll find many other people who are sharing information and raising awareness, in an effort to mobilize resources for organizations working with at risk kids, and working to help more kids prepare for 21st century careers. As we head through December, many people will be thinking of ways to share their blessings, or make this a better world. Cabrini Connections is not the only tutor/mentor program in Chicago. If you point friends and families to places like the Chicago Program Links on the T/MC web site, you can help us build support for Cabrini Connections and all other tutor/mentor programs in the Chicago region and in other cities. I heard a radio commercial as I drove to work this morning. It was created by LaSalle Bank/Bank of America, and encourages holiday donors to visit the bank and make donations to the Boys & Girls Clubs of Chicago. When I describe the Role of Leaders, this is one of my goals. I'd like to see leaders in every industry use their advertising to draw volunteers and donors to volunteer-based tutoring/mentoring programs in all parts of the city, not just the Boys and Girls Clubs. 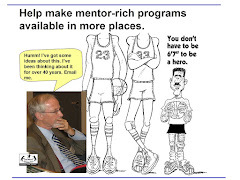 Most tutor/mentor programs are small. They don't have the brand name and clout of the Boys & Girls Clubs, YMCA, or Big Brothers Big Sisters, yet many do great work and many operate in neighborhoods where these groups don't have facilities. They can't find enough donors on their own, so the T/MC seeks to engage leaders in business and churches to use their advertising to help these various organizations get the resources during the year end holidays, and throughout the year that help them stay connected to kids. 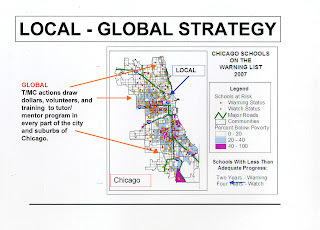 If people are encouraged to visit the Chicago Program Links they can find many choices in many neighborhoods. If advertising from different businesses focuses on different parts of the city, or in all neighborhoods where a company does business, then we do more to support the growth of tutor/mentor programs throughout the city. If your church, hospital, civic group, or business is integrating charity giving, or volunteerism into its advertising, please include this link, and send us an email to tell us what you're doing. I wrote about this in the Articles section of the Tutor/Mentor Connection site and encourage you to read my comments after you've read the P/PV article. If you'd like to submit an article to rebut or support my thinking, I encourage you to do so. 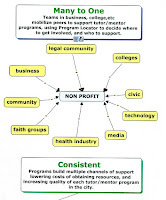 However, if you support the idea of mentoring as part of a larger strategy, then I encourage you to look for ways to connect with the T/MC during 2008 so we can expand business and philanthropic support, which is essential for building and sustaining high quality tutor/mentor programs. I've been building this blog for over two years now. I keep adding links to the left side of the page, to sites that I visit, which are entry points for vast areas of learning. I just updated the list today and added a link to The Raiser's Raiser a blog that writes about fund raising, and posts links to other articles of interest. If you lead a tutor/mentor program, or are a volunteer or donor, I encourage you to read some of these articles and follow the other links on the page. A couple of months ago I pointed out a report titled "Reframing School Drop Out as a Public Health Issue." I wish I had time to browse all of these links and see what connections I can make between them and the work the Tutor/Mentor Connection is doing, but I don't. So I'm appealing to readers to take on this role. In a way, I'm looking for volunteers to take the role of "scout bees" who go out looking for food sources, then alert "worker bees" who bring the food back to a bee hive. Here's an article on eLearnspace that prompted my thinking on this. If you follow this analogy, the T/MC web site is the bee hive/colony. People who go out through the internet and share information, like I do here, and here, are acting like scout bees. 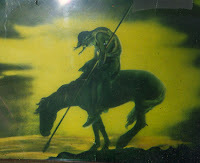 They are sharing our information in a wider network and are connecting the people and information in these networks to the T/MC web site and those who visit it. In many ways the scout bees are network weavers, acting to connect information and knowledge, with a purpose of making good things happen that are not possible by the efforts of people working in small groups, and in isolation from each other. By reading this blog, and passing it on to others, you're taking the role of a scout bee, worker bee, and network weaver.